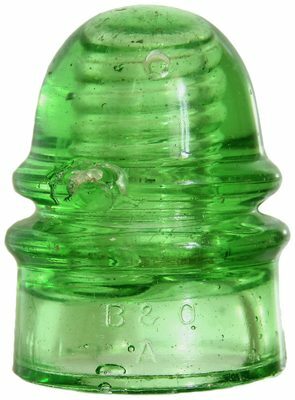 Lot 7: CD 136 B & O / DEC.19.1871 Color: Glowing Bright Depression Glass Green Description: 1" ridge chip as can be seen in the photo. 3/4" open bubble in the rear but no associated chipping around it. 1" clean bruise on the wire ridge in the rear. Some dings and scuffs here and there. What will strike you is the incredible bright glowing green color, and the thick glass amplifies it! Some "B & O" insulators were produced by Brookfield, but this example is clearly produced by Hemingray: note the DEC.19.1871 patent date. At the annual meeting of the Baltimore & Ohio Telegraph Company in 1884, it was reported that the system represents 6,886 miles of poles and 47,417 miles of wire. This insulator is even more impressive when you see it in person; it's a truly stunning color! Don't pass this opportunity by!